Quick Thoughts: HOW I MET YOUR MOTHER, "The Slutty Pumpkin Returns"
In a lot of ways, the deck was stacked against "The Slutty Pumpkin Returns." How I Met Your Mother had the disadvantage of airing its Halloween episode after stronger episodes like the ones from Happy Endings and Community, so it had an uphill battle. Right off the bat, everything was wrong with this episode. While, I'm a Katie Holmes fan, her appearance on the show was such blatant stunt casting that I couldn't take anything involving her seriously because we all knew it wasn't going to add up to anything. It was also frustrating to watch Ted complain about yet another potential suitor. I get that she wasn't supposed to be the mother, and how she was supposed to symbolize how holding on to the past can be a bad idea, but why should I invest any emotion into a one-shot character who we'll probably never see again? I just didn't find myself caring about anything Ted said or did in the episode. The same can be said about the whole Marshall-Lily plot line as well. I've pretty much come to terms with the fact that I will never be invested in them as a married couple, but unfortunately that's their role to play from now on. Their story line also suffered from HIMYM-itis which occurs when the show tries to force new pop culture phrases/concepts onto the audience. This time around it was pregnancy brain, which was half-baked at best. All of the jokes that revolved around this gimmick fell flat and made it hard to watch the episode. Even the Robin-Barney B-plot, which stayed away from the shippier elements, didn't do it for me because the writing felt lazy. We're still getting Canada jokes after all this time? Seriously? Apparently the writers cannot give Cobie Smulders better material after six seasons. At least I didn't have to watch her mope about Barney, which is always appreciated. Speaking of the Barnacle, the only highlight of the night was seeing him dressed up as Apollo Creed. That visual gag almost made up for the horribleness of the rest of the episode...almost. It also didn't help that Happy Endings got the drop on them. "Spooky Endings" already covered the "married couple debates about moving the suburbs" trope, and their take was funnier by far. Heck, Marshall even had a line that was pretty much delivered verbatim by Brad (wanting to be inside of an inanimate object). 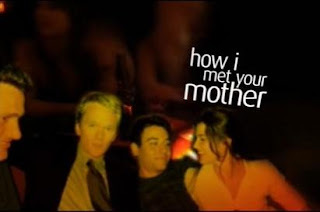 I'm not trying to say that HIMYM ripped off Happy Endings, but it was just proof that it's getting on in age and cannot keep up with the new kid on the block. It's Broken Record Time because I once again questioned why I wasted my time on HIMYM. I was even planning on skipping it altogehter because I can be disappointed another time, but I still tuned in despite my hesitations. It's my own fault for giving in, but there's still a tiny part of me that believes that this show can be good again, but I may be playing Ted to the show's Naomi. P.S. - I was disappointed that the title of this episode was not "It's The Slutty Pumpkin, Ted Mosby". They probably could not have gotten the clearance to begin with, but it felt like a missed opportunity.